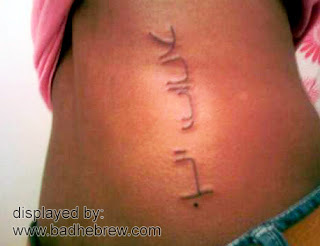 When I first saw this tattoo, I thought it wasn't Hebrew writing at all. It looks like some weird script, Martian maybe? The victim claims this Hebrew-like doodle to be her name, and on closer inspection I realized that it really was. It just so happened that when trying to render her tattoo vertically, some letters were rotated and some were not, creating this very strange result. In any case, the Hebrew tattoo most likely says "Ebony Eve". Most likely, since aside from being mis-rotated, it's also slightly misspelled. So if you have another interpretation of this name, I'd love to hear it! And this is how you would correctly write "Ebony Eve" in Hebrew. Ebony on the right, Eve is on the left. My suggestion, when it comes to words which have letters of different height, is not to rotate it letter by letter. It just doesn't look nice. Looking at that for a bit, I think I know why she ran into the spelling issues that she did. She's got her transcription into Yiddish, not Hebrew. The rotated vav sure does look odd, indeed. But the ayin for "eh" in "ebony" really does seem Yiddish. That's possible, though this picture was labeled as Hebrew when I found it. Maybe the translator didn't know the difference. Could you translate the following into Hebrew? You are the captain of my soul." unless it is a verse from the bible or something, in free translation it means: אתה אדון גורלי, אתה הקברניט של נשמתי"
את =you=at (female). The word captain is used as well in hebrew = קפטן=kepten, but in your sentence I translated that to קברניט (like the captain of a ship). גורלי, נשמתי, are more printed forms than spoken. I would've actually preferred letters to be individually printed in vertical rather than turning the whole thing 90 degrees. Forces you to tilt your head like a confused dog. Another example of where actual Hebrew would be much more poetic: Chaba Shechura flows quite nicely. And it DOES have a yiddish look to it. Most people see hebrew letters and think "Hebrew language", which could explain the mislabel. I think my son's tattoo was done backwards. We had his name, zachary spelled out from the temple, but I asked for it vertically but they didn't. He took it to the tattoo place did it but idk if it's right. Whats 9 9 25 in hebrew?